I recent­ly came across the prob­lem that I need­ed a PWM (i.e. pulse-width mod­u­lat­ed rec­tan­gu­lar sig­nal) gen­er­a­tor block in Simulink with vari­able fre­quen­cy and duty cycle inputs. I couldn’t find one in the library, so I wrote one. The rather sim­ple imple­men­ta­tion basi­cal­ly con­sists of three parts: An inte­gra­tor block with an exter­nal reset input is used to cre­ate a saw­tooth sig­nal. The saw­tooth is then com­pared to a thresh­old val­ue giv­en by means of the duty cycle to cre­ate a rec­tan­gu­lar sig­nal. Last­ly that sig­nal is scaled to a stan­dard out­put range of 0..1. Just a quick and dirty non-tuto­r­i­al solu­tion on how to use the mul­ti­plexed I/Os (MIO/GPIO) to wire the BTN4 but­ton on the ZYBO board (MIO50, the right one) to the LD4 LED (MIO7). Both are con­nect­ed direct­ly to the pro­cess­ing sys­tem and can­not be con­trolled from the fab­ric. 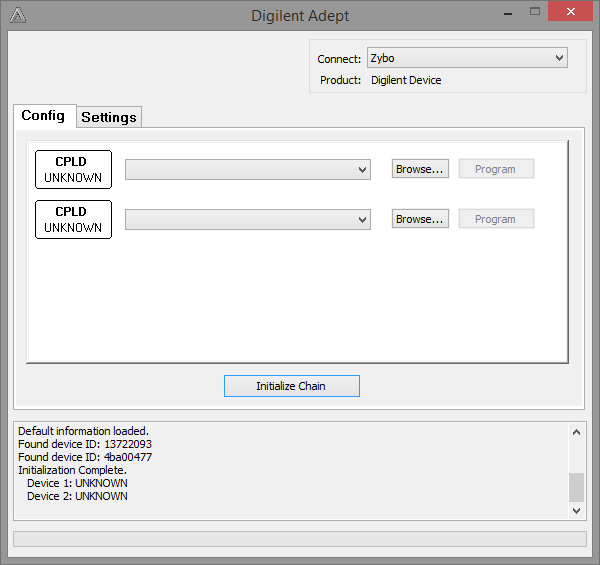 // initialize the GPIO driver. Note that when you open the system.mss file in SDK, you’ll find the ps7_gpio_0 entry under the Periph­er­al Dri­vers sec­tion. Click “Exam­ple” there to find more infor­ma­tion. 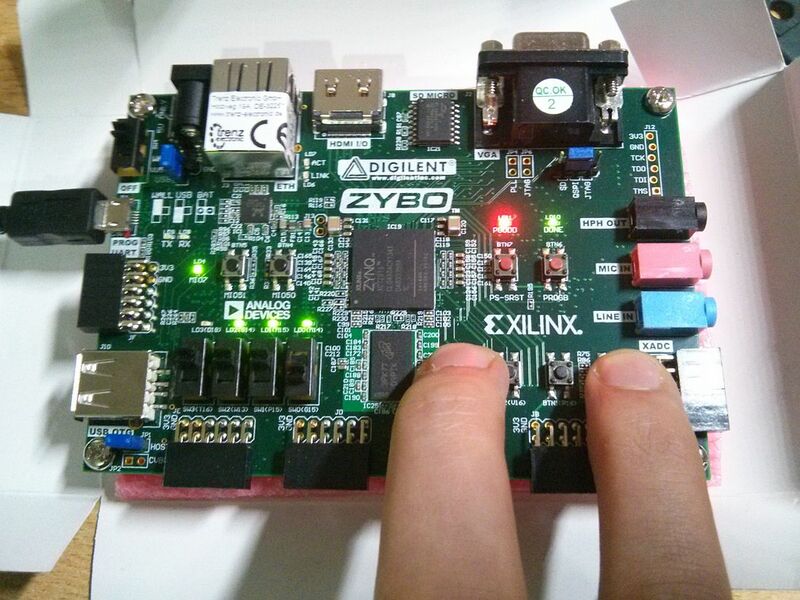 Because I des­per­ate­ly searched for some­thing like that and found noth­ing, I just wrote a tuto­r­i­al myself on how to start with the Xil­inx PlanA­head work­flow in ISE 14.7 when using the Dig­i­lent ZYBO board. Though I made this with the ZYBO in mind, the gen­er­al work­flow also applies to Zed­Board users and prob­a­bly gen­er­al Zynq boards as well. It can be found at http://sunsided.github.io/zybo-tutorial/. 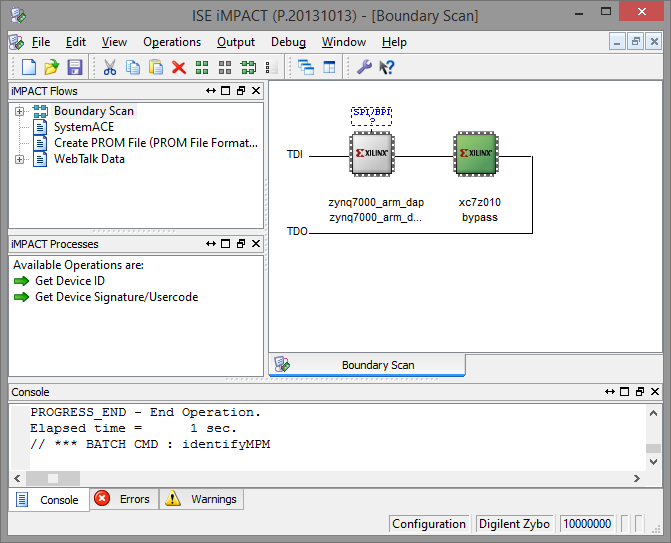 using the Xil­inx tools. You can also find that nice pic­ture of my fin­gers there, too. 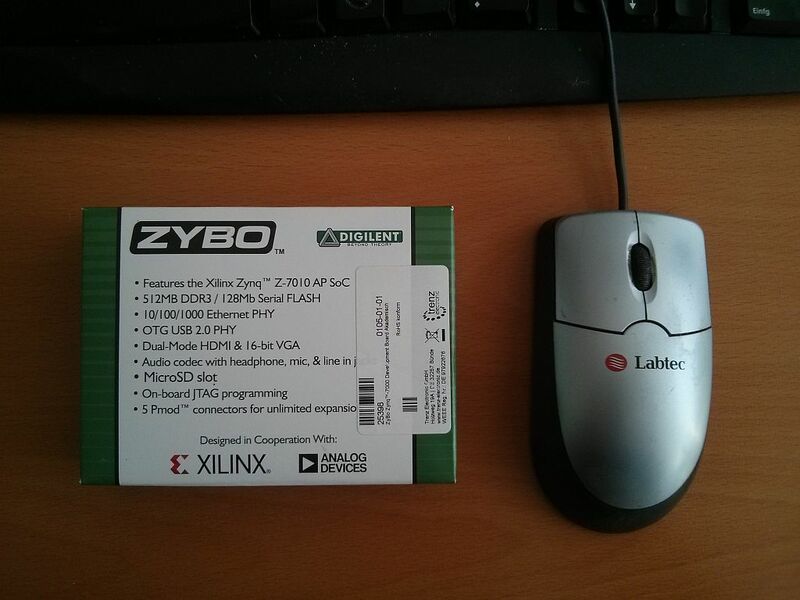 Johann wrote a tuto­r­i­al on using the ZYBO with Viva­do on Lin­ux. It can be found here. It turned out that this is due to an exist­ing instal­la­tion of Git, when the Git direc­to­ry is added to the path. Specif­i­cal­ly, sh.exe is the prob­lem here and sim­ply remov­ing that from (or renam­ing it in) the Git instal­la­tion direc­to­ry solves the prob­lem. 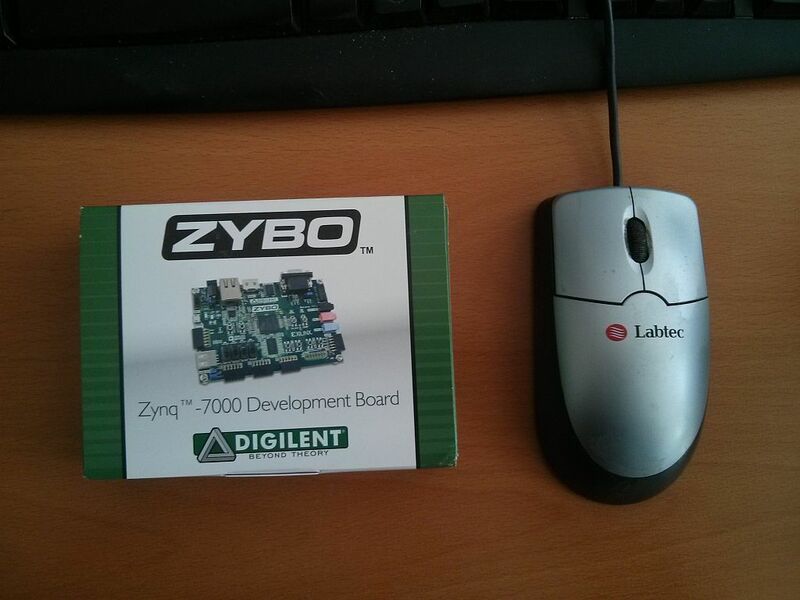 The ZYBO is an eval­u­a­tion board for the Xil­inx Zynq-7010 All-Pro­gram­ma­ble SoC made by Dig­i­lent. I got mine from Trenz Elec­tron­ic at a reduced price for aca­d­e­m­ic use. I chose it over the Zed­Board (which I already have some expe­ri­ence with) because of the reduced size and since I don’t need the high-den­si­ty I/O jack. It turns out though that the board is very small, yet quite heavy. One thing to keep in mind though is that despite the rather large num­ber of PMOD con­nec­tors, not all of them might be actu­al­ly use­ful for a giv­en task. The one on the left is con­nect­ed to the Cor­tex proces­sor, the right one is mixed analog/digital, and the three low­er right ones are dif­fer­en­tial, leav­ing exact­ly the one on the low­er left as a log­ic-ded­i­cat­ed PMOD for the FPGA (i.e. 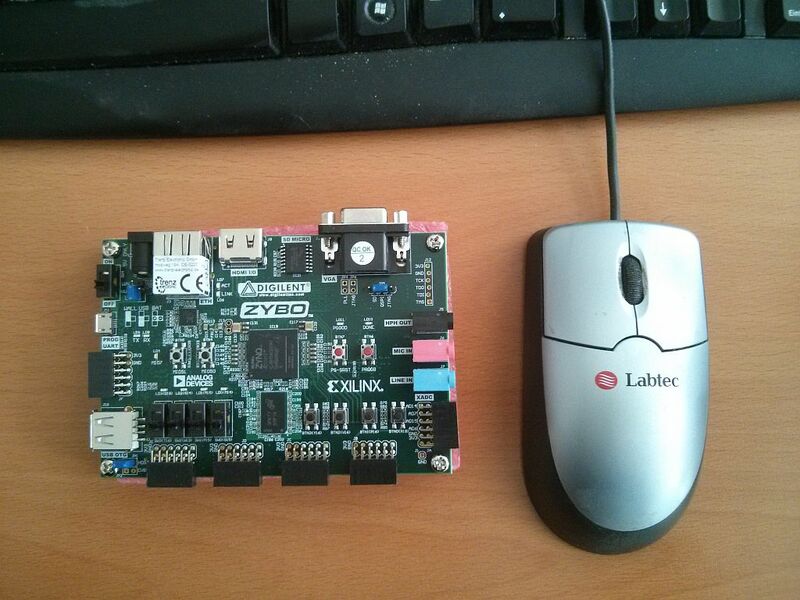 a sin­gle end­ed one that is con­nect­ed direct­ly to the FPGA, apart from the XADC one, of course). I orig­i­nal­ly intend­ed the board to be used to exper­i­ment with the OV7670 cam­era, but that might turn out to be a prob­lem because of the PMODs. So: Caveat emp­tor. I had some trou­ble get­ting Dig­i­lent Adept and/or iMPACT to rec­og­nize my board (despite hav­ing installed the nec­es­sary plu­g­ins), because I had down­loaded the wrong ver­sion of Dig­i­lent Adept — sad­ly the search box on the Dig­i­lent web­site yield­ed Adept 2.3 as the best hit, which is out­dat­ed. After down­load­ing the recent ver­sion from here, every­thing worked as expect­ed and the device was cor­rect­ly iden­ti­fied by iMPACT. Unfor­tu­nate­ly, while Digilent’s own soft­ware, Adept, was now able to talk to the board too, it was still unable to rec­og­nize the chip. Edit: After ask­ing Dig­i­lent sup­port I received a mail say­ing that the Zybo can’t be pro­grammed with Adept, so that’s expect­ed behav­ior. Edit: I wrote up a quick-start tuto­r­i­al for the ZYBO. You can read more about it here.